Wow, it’s been awhile since I have written anything on PDJ, but my lack of reporting does not reflect the group. We have been very busy with the Peace and Dignity Journeys here in San Diego. We are made up of a small dedicated group of native and non-native people from various ethnicities and parts of San Diego. Our work is rewarded with many blessings, but does not come with glory, we do it for the love and to fulfill the prophecy of the Eagle and the Condor to bring the continent together across all borders. 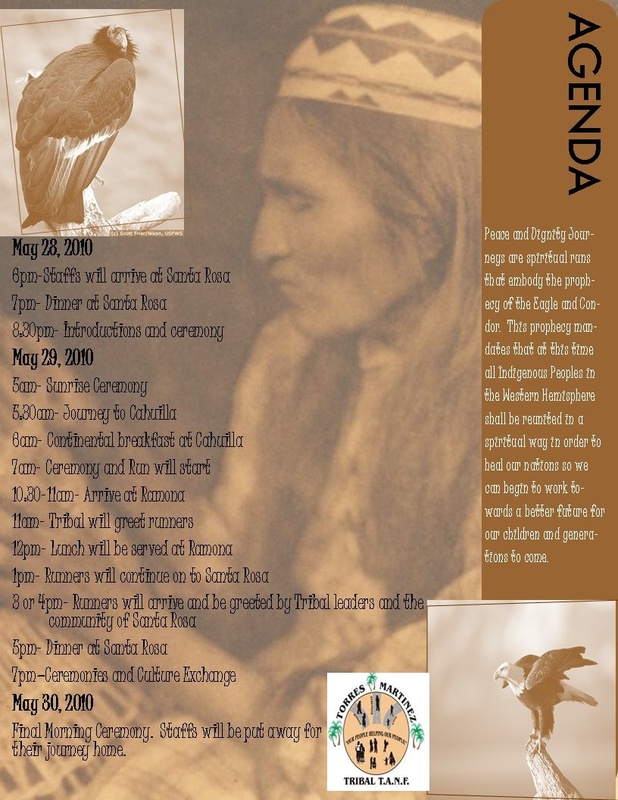 In our recent work we are very proud to announce the three reservations have come together to organize a unity run between the Cahuilla, Ramona and Santa Rosa reservation. They have seen division amongst the young people and the adults from this region of what is now Riverside County. They are a very proud and honorable people and for this reason we support their work. Below is a flier for their Unity Run. If you are interested please contact me asap and I can give you more information.